“Orthodox Christianity,” “the Orthodox Church,” and “Orthodox Christian” are all terms that, if you are a western Christian, may be very unfamiliar to you. Sure, you may have seen an Orthodox Cross or be familiar with My Big Fat Greek Wedding, but in terms of really knowing what Orthodoxy is, well… perhaps not exactly. In a nutshell, Orthodox Christianity is the second largest body of Christians (second only to Catholicism) with around 300 million people worldwide. 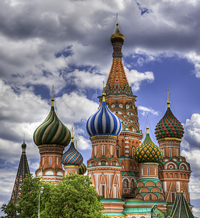 The Orthodox Church’s members exist on most parts of the globe, but primarily in Russia, the former Soviet republics, and Eastern Europe. Orthodox Christians believe that their Church, the Orthodox Church, is the Church founded by Jesus Christ, and then spread by His Apostles and their followers to the rest of the earth. 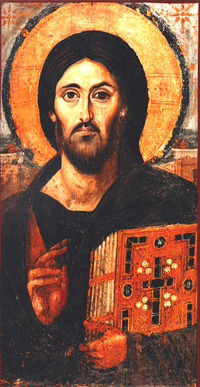 Orthodox Christians believe that Jesus’ Apostles helped ensure the continuity of Christ’s leadership, and doctrine, of the Church by setting up bishops to preside over major cities. Those bishops then ordained priests to lead individual churches. This passing on of the leadership of the Church began a process called “apostolic succession,” which means that the authority and teaching of the Apostles was transmitted from generation to generation, without interruption, through the leaders of the Church, throughout history, to this very day. The Orthodox Church believes that clear apostolic succession is documented, in its case, and that it is the Church that “the gates of Hell will not prevail against,” as spoken about by Christ, to St. Peter in Matthew 16. False teachings were constantly arising which threatened the continuity in doctrine of the Orthodox Church. The Church’s solution was very similar to what is found in Acts chapter 15, when the dispute arose concerning what to do with Gentile converts. The Orthodox Church began to hold councils. The seven most important, and universally accepted of these, are called the Seven Ecumenical Councils. The Seven Ecumenical Councils were attended by a large number of the bishops of the Orthodox Church and produced such things as the Nicene Creed and the New Testament. These councils also clarified, in writing, the major doctrines of the Church. The Orthodox Church believes that the Holy Spirit guided the men at the Ecumenical Councils to articulate doctrine consistent with what was taught by Christ and His Apostles. The Seven Ecumenical Councils took place during the first eight centuries of Christianity. By the turn of the millennium a tension had grown in the leadership of the Church between the bishops highest in honor from the west (called Pope) and from the east (called Patriarchs). Some of the tension was caused by distance, misunderstandings, and the global politics of the time. Some of the tension had to do with the ultimate leadership of the Church. The Pope claimed that he was the first in authority and not merely “the first among equals,” as was the claim of the Patriarchs in the east. This led to the Pope’s ability to change doctrines, without Ecumenical Councils, which was something not accepted by the other Patriarchs. This situation caused the Great Schism, ending the relationship between the eastern and western halves of Christendom. 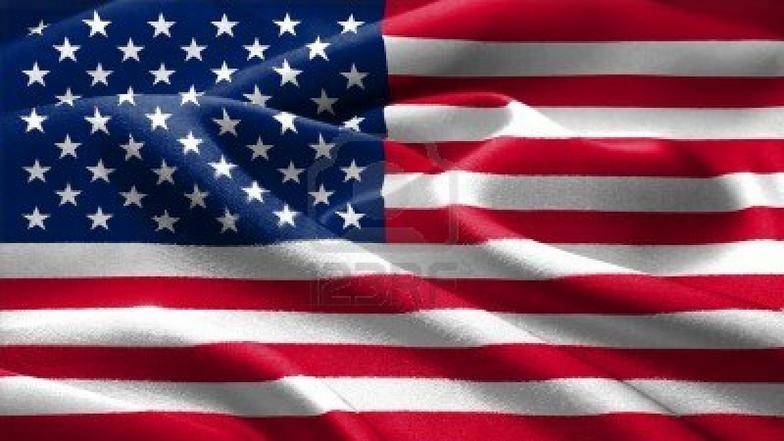 The west is what we know today as the Roman Catholic Church and the east is what is known as the Eastern Orthodox Church, the Greek Orthodox Church, the Orthodox Christian Church or simply the Orthodox Church. 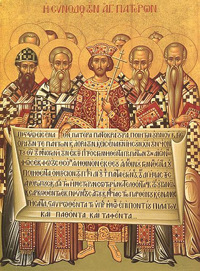 From the time of the Apostles to the present day, the Orthodox Church believes that, with the leadership of Jesus Christ, through the guidance of the Holy Spirit, and with the means of apostolic succession, it has held fast to the doctrines of the Christian Faith that were set forth at the Seven Ecumenical Councils. Five centuries after the Great Schism, when Luther and company “protested” the Catholic Church, the Orthodox Church was nearly an unaware bystander, on the other side of the globe. Today, as Orthodox Christian immigrants from the eastern part of the world move west, and share their Faith to Protestants and Catholics alike, they often do so unaware of the many changes that have happened to the Christianity in the west. Likewise, Protestants and Catholics of the west are often unaware that there is an Eastern Orthodox Church that has remained unchanged since the time of the Apostles, with regards to doctrine, possesses apostolic succession, and has begun to gain traction in the west. It is with this background that we welcome Fr. Vasili Hillhouse, an Orthodox Christian priest from Holy Transfiguration Greek Orthodox Church in Anchorage, Alaska. Our goal is to open up the Orthodox Church, a little further, to any Protestants or Catholics, who might be unfamiliar with this 2000 year old Church, and to do so in a more personal way. ORTHODOXRINGS.COM: Hello Father, thank you for taking the time to be with us. FR. VASILI: It’s my pleasure. ORTHODOXRINGS.COM: At the beginning of our “nutshell” description of the Orthodox Church, we say that the Orthodox Church believes that it is the Church begun by Jesus and His apostles. Many churches may make this same claim. How important is it, especially for a Protestant Christian unfamiliar with Orthodox Christianity, to understand apostolic succession, what it is, and the role that it plays in the Orthodox Church? FR. VASILI: Well, apostolic succession is the transmission of the Faith through the operation and inspiration, we would say, of the Holy Spirit. Our bishops and priests receive ordination through the laying on of hands, just like in the Book of Acts. The Apostles themselves were chosen by Christ and ordained, so to speak, by the Holy Spirit at Pentecost. From that day, through the practice of ordination, those becoming clergymen are given, by grace, a share in Christ’s priesthood. Christ is the high priest and, as clergymen, we receive a share in that Priesthood. So, apostolic succession is dependent on this continuity which you can see historically from Bishop to Bishop, and is also dependent on the operation of the Holy Spirit in accomplishing each ordination, and the inspiration of the Holy Spirit in guiding the Church into all truth and preserving it from heresy, any false teaching about who God is, century after century. ORTHODOXRINGS.COM: It is probably safe to say that the Seven Ecumenical Councils are completely unknown by a majority of Christians in the west. What are the Ecumenical Councils’ significance in the Orthodox Church and what have western Christians missed out on most by not being aware of their place in Christian history? FR. VASILI: Well, we use the Ecumenical Councils to clearly articulate truth, not to “define” truth, for God is Truth and is beyond all definition. It is important to remember that the Church has existed from eternity – it is not man-made; in heaven, the angels are constantly worshipping God, singing, “Holy, Holy, Holy, Lord of Sabaoth.” The Church has existed here on earth, from the time that Christ planted it. And from that day, the Church has used councils, like in the Book of Acts, to articulate what we already know to be true about Christ and about His Church and about salvation. So, the decisions made at the Ecumenical Councils are reached through the guidance of the Holy Spirit and are found in the consensus of the whole body. So it’s not up to one person to decide dogma or to be the caretaker of the tradition and the teachings of the Church, rather, those things are preserved through the Ecumenical Councils and the gathering of all the Church as a whole, and again, are supported and guided by the operation of the Holy Spirit. It always states in the Ecumenical Councils, quoting from the Council of Jerusalem recorded in the Book of Acts, “it seemed good to us and the Holy Spirit...” So, again, “us,” you see the conciliar nature, and the “Holy Spirit.” And this could be an audacious or an arrogant claim if it wasn’t true, but it is true and we do believe that the Holy Spirit is there in the Ecumenical Councils guiding and preserving the Church into all truth. Western Christians, who are unaware of the existence of the councils, are missing out on the continuity of the Faith as it was given by Christ to his Apostles. Without this apostolic continuity to guide you, it is easy to get lost in the forest of one’s own making, and that is when heresy is introduced. ORTHODOXRINGS.COM: Most of our comments, to this point, have been about the Orthodox Church in general. Let’s move to the members of the Orthodox Church, Orthodox Christians. 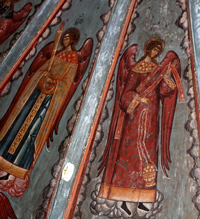 What does it mean to be an Orthodox Christian, both practically and spiritually? FR. VASILI: Well, for me it means that I’m a member of the One Holy Catholic and Apostolic Church. It means that I’m a member of the Church founded by Christ and his Apostles, as we’ve already said. And it means that I actively work in synergy (synergía) with God for my salvation. For me it means that I strive to become like Christ and to be united with him in a bond of perfect love, freedom and joy – that is salvation, an intimate relationship with God, and it is the only thing that truly matters. When someone first encounters the Orthodox Christian Faith, it is easy to be taken with all of the aesthetics – the icons, incense, and chanting. But one must understand that the purpose of all of this, the purpose of the spiritual life, the purpose of Apostolic Succession and the Ecumenical Councils is to help facilitate a personal relationship with Christ; a relationship that is based on truth and a brutal self honesty. That honesty means that we acknowledge before God that we continually fall short of our calling as human beings created in His Image and Likeness, and confess before Him that we need to be saved. In the Orthodox Church we never stop working on our relationship with God – never. That is why we can’t ever say, “I am saved”; rather we say, “I am being saved”. ORTHODOXRINGS.COM: If someone has an interest in learning more about Orthodox Christianity how would you direct them? FR. VASILI: I would direct them to the nearest parish. The tagline, if there is a tagline, for the Orthodox Church is “come and see” and really it’s the best way to look into Orthodoxy. Go to a parish and experience the worship and the Faith and the love and the Holy Spirit that you will experience there and from that point they can talk to the priest or even to the parishioners and find their way, but the best thing is to just go and see. ORTHODOXRINGS.COM: That’s great! If someone isn’t quite ready to visit an Orthodox Church in person, what other advice can you share? FR. VASILI: Well, I would direct them to start reading. Read the history of the Christian Church, and there are many books out there where you can find that type of information. 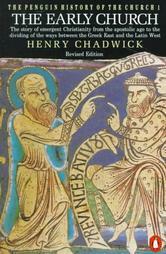 I would recommend The Early Church by Henry Chadwick, and The Orthodox Church by Kallistos Ware. There are so many other helpful books out there that depend on where one is coming from – some are geared more towards protestants, like Becoming Orthodox by Peter Gilquist, and some are geared towards those with no Christian background at all, like Indication of the Way into the Kingdom of Heaven by St Innocent of Alaska. Beyond reading, it is also so important to pray, to ask God to direct you to the right place. Without His Guiding Spirit we would all be lost. ORTHODOXRINGS.COM: Thank you very much, Fr. Vasili, for speaking with us today about the Orthodox Church, Apostolic succession, the Seven Ecumenical Councils, and what it means to be an Orthodox Christian. FR. VASILI: It’s my pleasure. I love the opportunity to talk about my faith. It means a lot to me and I love to share it. Fr. Vasili Hillhouse is the Pastor of Holy Transfiguration Greek Orthodox Church in Anchorage, AK, home of the Alaska Greek Festival. OrthodoxRings.com is a web-based Orthodox Christian business dedicated to providing precious metal Orthodox Christian rings and wedding bands to people of the ancient Christian Faith worldwide.